The Filipino Flash' Nonito Donaire says sorry to all his fans all over the world after lossing the fight against the Cuban boxer Guillermo Rigondeaux. This is the second time defeat in his whole boxing career. Guillermo Rigondeaux retained his WBA super bantamweight championship title and gets Donaire's WBO super bantamweight belt. Nonito Donaire tweeted this after the match, "I'll come back and do better," then added, "For now, I congratulate Rigondeaux." He also said, "I tried to give my all and push the fight, but we'll be back." While, Rigondeaux said. "Donaire's an excellent fighter but you cannot win a fight with one shot." According to news, Donaire is planning to move up to the featherweight division. Top Rank CEO Bob Arum, Donaire's promoter, will try to match him with Juan Manuel Lopez, soon. For the meantime, If you like this information, please bookmark it now or visit this site more often for you to be updated. You may also share this post to your friends so they may know about Nonito Donaire's fight result. 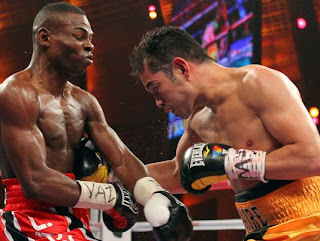 Comments or suggestions about "Nonito Donaire lost to Cuban boxer Rigondeaux" is important to us, you may share it by using the comment box below.